As a kid, I always hated mushrooms! I know, crazy! 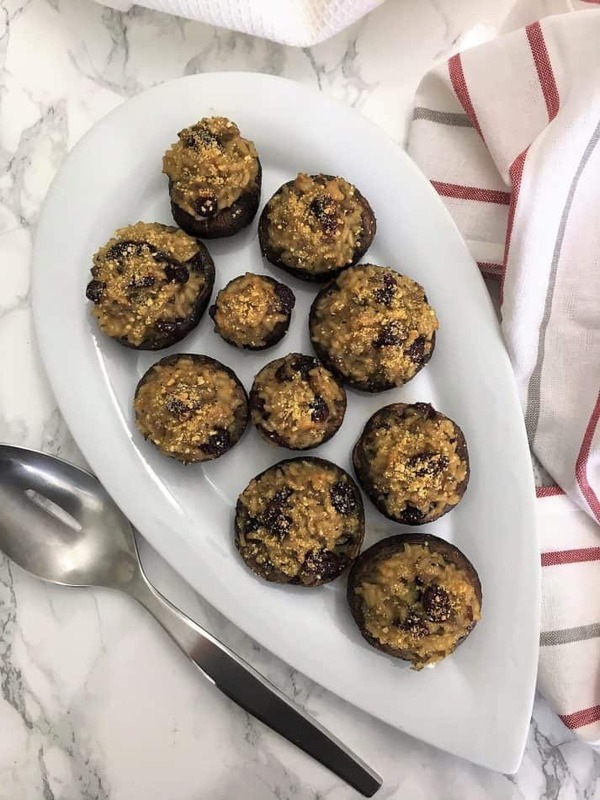 I think it’s safe to say that stuffed mushrooms is one of my favourite appetizers. There’s just so many delicious things to stuff them with and so many ways to prepare them. Yum yum. Well, today I’ve veganized one of my favourite dishes for you. 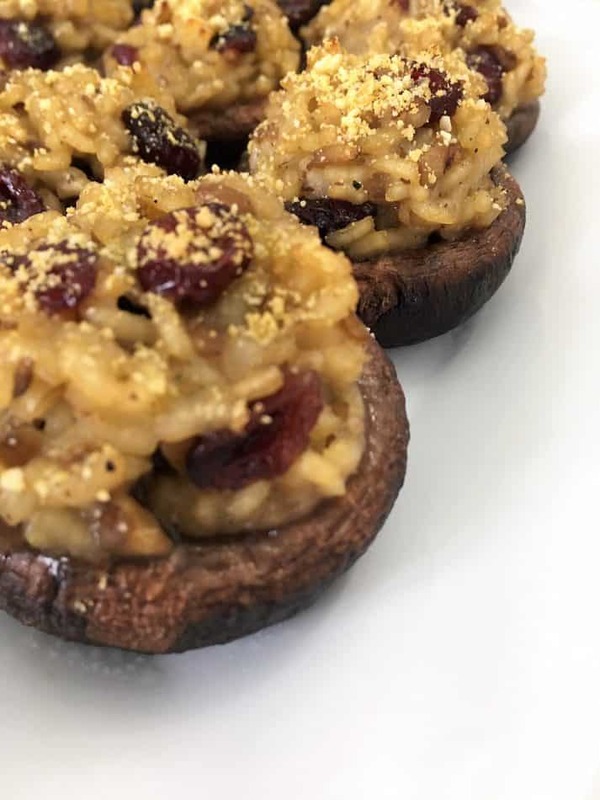 Here are my AMAZING vegan stuffed mushrooms, featuring a TRUE Italian style risotto! Are you drooling yet? To begin, you need to very carefully remove the stems. Use a paring knife to dig it out, but move slowly so you don’t cut your mushroom. (Maybe buy a few extra if it’s your first time, just in case.) Once the stems are all removed, chop them finely and set aside. Then, using a small spoon, carefully scrape away the gills. Although edible, this will give you more room for delicious stuffing. Plus the colour is not exactly appetizing. I use an espresso spoon to scrape mine. A baby spoon will also work if you have one. Or, use the tip of a metal teaspoon. 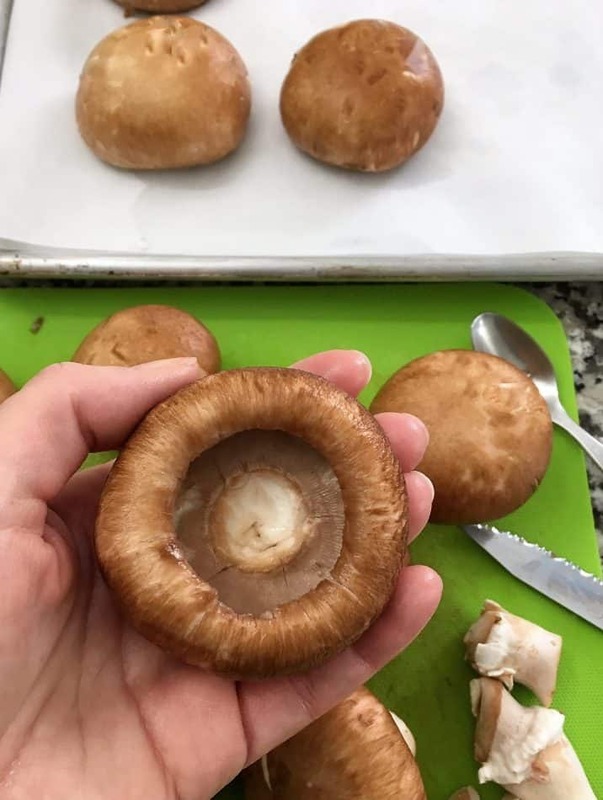 Once your mushrooms are cleaned and hollowed out, place them hollow side down on your baking sheet. Brush the tops with olive oil, and bake for 10 minutes. This will reduce the mushrooms, and allow most of the moisture to escape, preventing soggy mushrooms later. Now for the delicious risotto stuffing! Sauté your onion, mushrooms stems and garlic. Then add the rice to coat in the oil. When you’re adding your broth, DO NOT add it all at once. 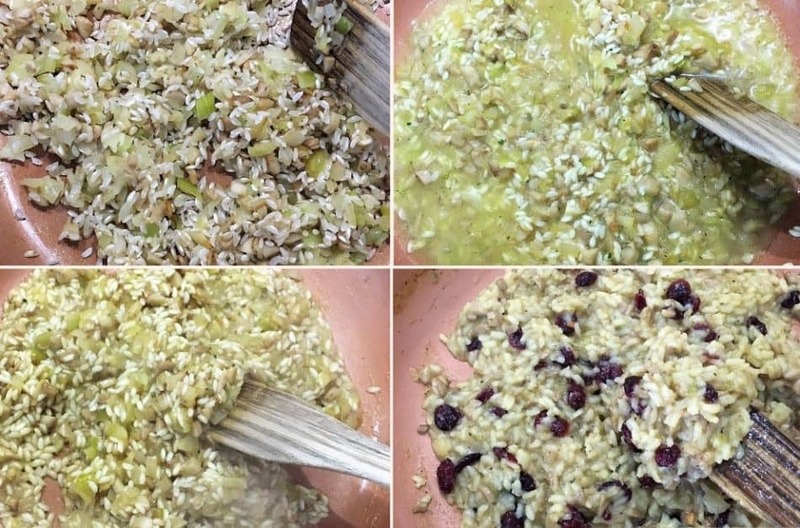 Yes, it may seem tedious, but this is how to make true Italian style risotto. Add approximately half a cup of broth at a time. Stir often, and once the broth is absorbed, (and only then), add more. Your rice will slowly grow and cook in the true Italian way. Once your broth is finished, fold in the cranberries. Now you’re ready to stuff your mushrooms and bake them to perfection! YUM!! I sprinkled mine with some vegan Parmesan cheese, but this is completely optional. You may also use regular Parmesan if not dairy free. 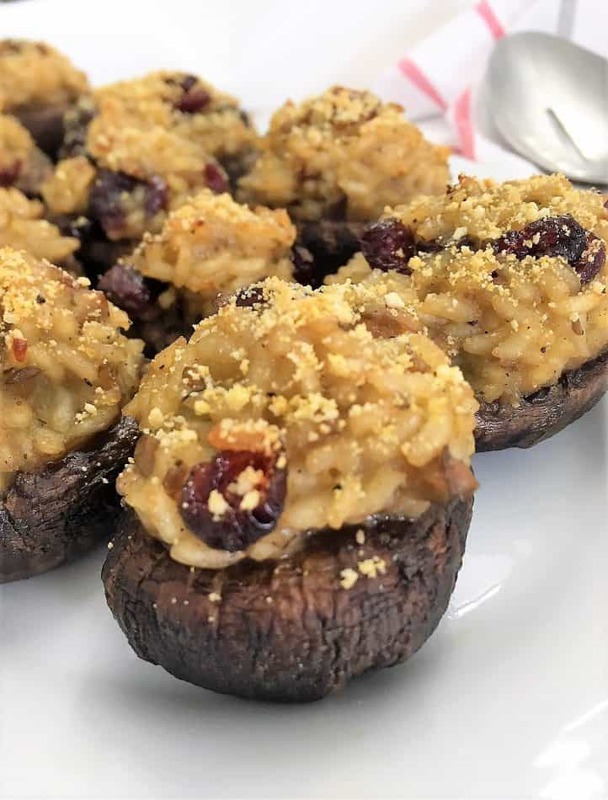 These vegan stuffed mushrooms make a perfectly delicious, satisfying, SCRUMPTIOUS appetizer for Christmas, or any special occasion. Or any day if you really love mushrooms as much as I do! For more holiday, festive recipe inspiration, check out this AMAZING (yup), Seriously the BEST Vegan Lasagna! Perfect for your main course. 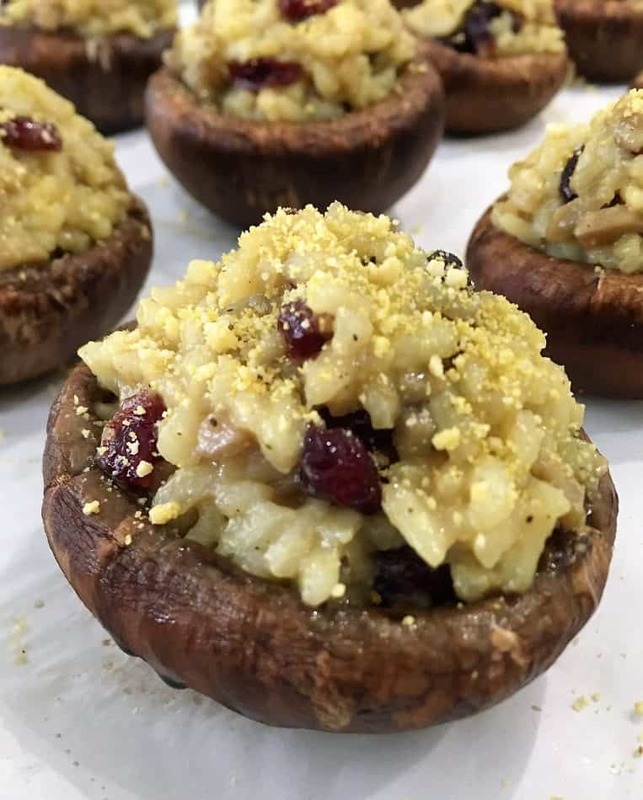 You know, right after you inhale these vegan stuffed mushrooms. Need some dessert? How about some Brownie Peppermint Cookies or classic Easy Gingersnap Cookies! The perfect sharing appetizer for your next function. Delicious mushrooms stuffed with true Italian style risotto will certainly impress your guests. 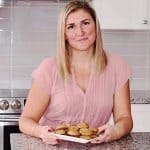 Preheat the oven to 375 degrees F and line a baking tray with parchment paper. Using a paring knife, carefully remove the mushrooms stems, finely chop them, and set aside. Then using a small spoon, carefully scrape out the gills and discard. Place the mushrooms hollow side down on your tray and brush the tops with your olive oil using a silicone brush. 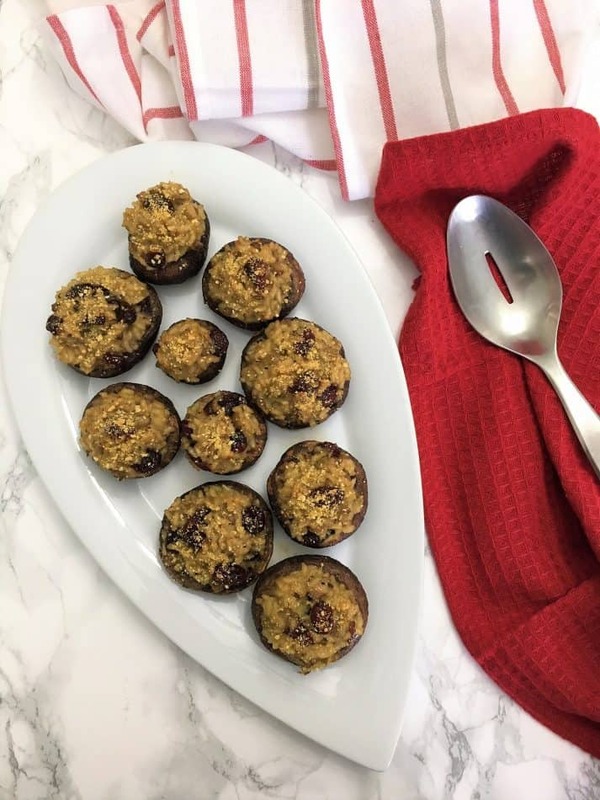 Bake for 10 minutes and then using a paper towel, absorb any excess moisture that the mushrooms released during baking, and flip them hollow side up. Set aside. Meanwhile, start preparing your stuffing by adding the cooking oil, onion and chopped mushroom stems to a large skillet. Cook over medium heat for about 5 minutes until softened and reduced. Then add your garlic, salt and pepper and give it a stir. Then add the rice and mix well until rice is coated with the oil. Next you will add 1/2 cup of your vegetable broth to the skillet, stirring often until absorbed. Continue adding 1/2 cup at a time, stirring your risotto often. Wait until the liquids are absorbed before adding the next portion of broth. Continue doing so until all 4 cups of broth are used. This process should take around 20-25 minutes. Remove from the heat and add your cranberries and mix to combine. Turn up the heat of your oven to 425 degrees F. Then, divide your stuffing mixture between your mushrooms. You want your mushrooms heaping with the stuffing. Then sprinkle the stuffed mushrooms with Parmesan cheese if using and bake for 15 minutes. Serve warm. Add all the ingredients to a food processor and process until a fine meal is achieved. 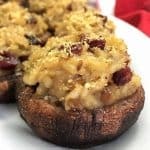 I’ve never thought of doing stuffed mushrooms with risotto inside, definitely going to have to try these now!